In June, Presonus offers 25% off Studio One 3 Artist or Studio One 3 Professional, including upgrades, crossgrades, and educational versions. Until the end of the month, Waves offers an opportunity to get 25% off both versions of PreSonus Studio One 3. As announced, Presonus has released update 3.2 of their DAW Studio One, with several new features. 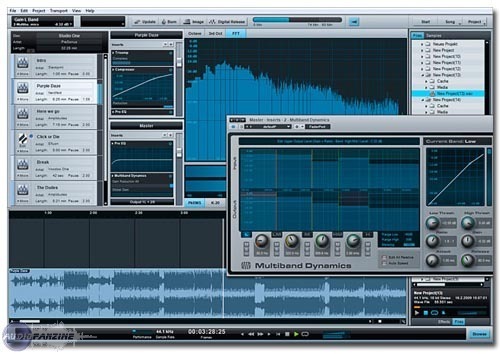 On February 25th, Presonus will release version 3.2 of Studio One. While Presonus's new Studio 192 USB audio interface hits the shelves, it is accompanied by a major update to the brand's DAW. Studio One users have been awaiting a major upgrade for quite some time. Studio One 3 is the first such update since October of 2011, when Studio One 2 hit the market. PreSonus has added new instruments, new effects, new graphics, new ways to arrange songs, and quite a bit more, so lets see what version 3.01 has to offer. PreSonus had announced it when releasing v3 of its DAW, the free Prime edition of Studio One is now available for download. Three years after v2, PreSonus finally launches the third generation of its Studio One DAW on Mac OS X and Windows. 2 special offers now at PreSonus, one for the Studio One DAW and the other one for the Notion notation software.